Koolatron is one of the top manufacturers in the thermoelectric coolers industry. These coolers are kept cold simply by plugging them into a 12-volt outlet in any vehicle. 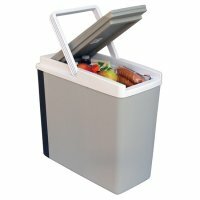 12Volt-Travel® has Koolatron travel coolers, Koolatron accessories and Koolatron cooler replacement parts. Perfect for road trips and everyday commuting. Designed to fit between most van, Minivan or SUV seats for added convenience. • Exterior HxWxD: 16.25" x 17.5" x 8.5"
Top performer! Lightweight, Powerful, Efficient and easily carried with the included shoulder strap. This cooler is made for on-the-go portability. • Dimensions HxWxD: 15" x 17.5" x 9"
Store food and drinks for the weekend. Cooler lid is easily removed for cleaning! Cooling fan is built into lid for easy cleaning & cooling. • Exterior LxWxH: 16" x 11.75" x 17"
• Interior LxWxH: 12.6" x 8.75" x 13.3"
Thermoelectric operation saves money and time stopping for ice while OTR. Capable of Horizontal or Vertical operation. • 29 Quart Capacity OR 48-12oz cans. 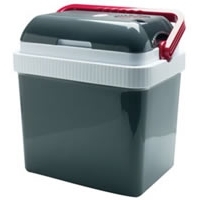 • Exterior LxWxH: - 15.5" x 16" x 17"
• Interior LxWxH: 12" x 12" x 12"
Split lid design with slide lock allows easy access to stored food, drinks, medications and more. Lay it down or stand it up like a mini-fridge! • Exterior LxWxH: 19.5" x 13.75" x 16"
One of our most popular 12 volt coolers! AC/DC Operation for convenience and versatility. 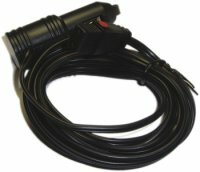 • Exterior HxWxD: 20" x 18.5" x 17"
• Includes 12V & 110V Power Cords!